This is my go-to pasta sauce. Here's the thing. Anyone can go out and buy a jarred spaghetti sauce. Yes, it's easy. Yes, it's convenient. And, we all love easy and convenient. 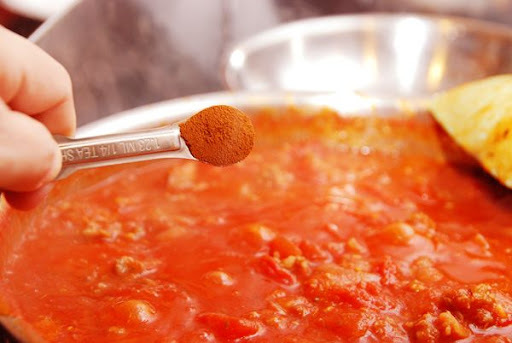 BUT, what if you could make a homemade sauce that is just as easy, just as convenient as a jarred sauce, but tastes SO MUCH BETTER? Before I show you how to make it, let me tell you what I love about this sauce. It's serve over some penne for a delicious lunch sauce. It's double the recipe and freeze sauce. 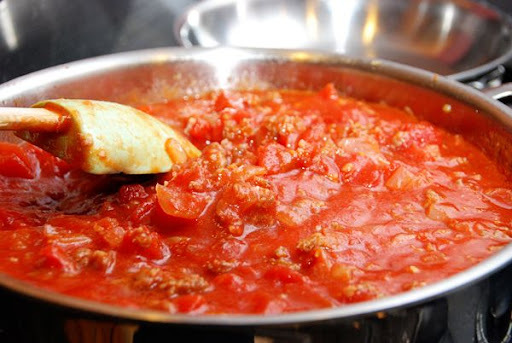 And, it's so fresh, and so delicious, and it has this WONDERFUL secret ingredient that will make "your" sauce taste different (and better) than anyone else's sauce. Are you ready? Let's make some homemade pasta sauce. 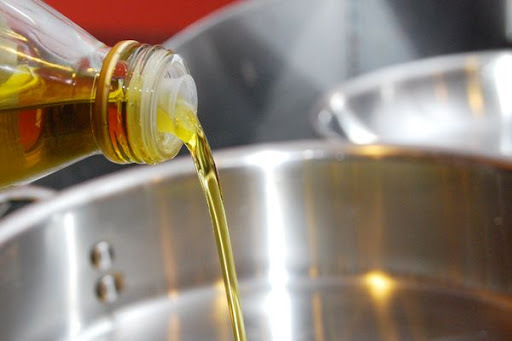 First, pour a couple of tablespoons of olive oil in a sauté pan or pot or whatever you usually make spaghetti sauce in. 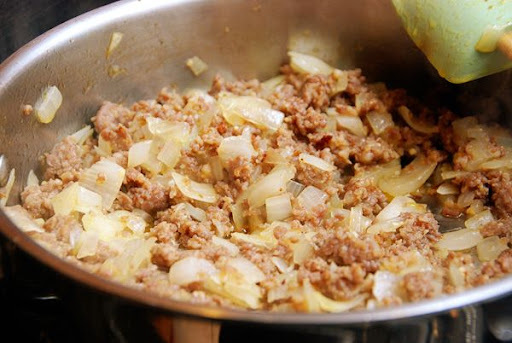 Then, add one large diced onion and one pound of sausage (mild, sage, Italian, spicy, Jimmy Dean, Bob Evans, a specialty sausage) - whatever kind of sausage you like. 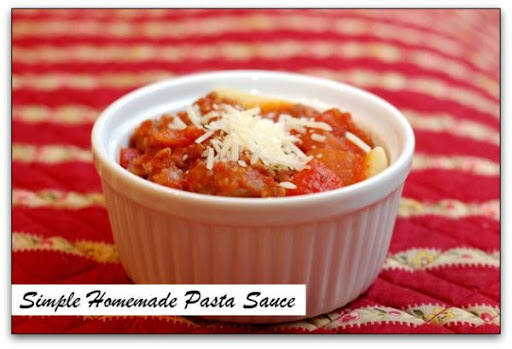 Sausage is one of the key ingredients in this sauce. If you really want to use ground beef, that'll work, too. 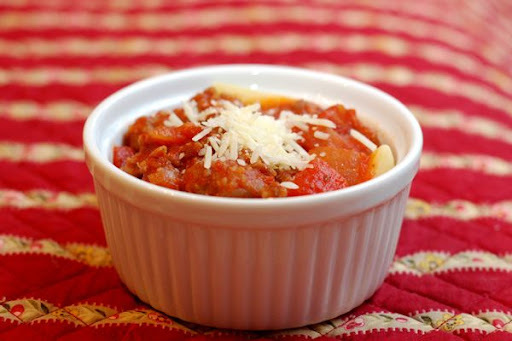 Once the sausage is cooked and the onions are tender, add one large can of crushed tomatoes. 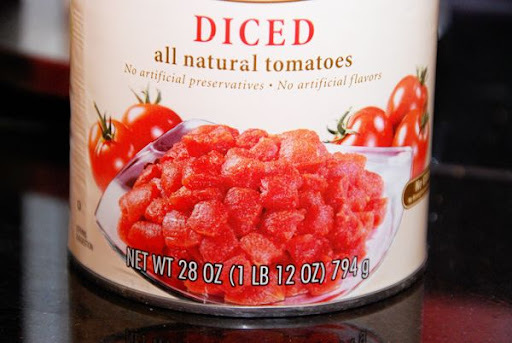 And, one large can of diced tomatoes. Look how beautiful that color is. 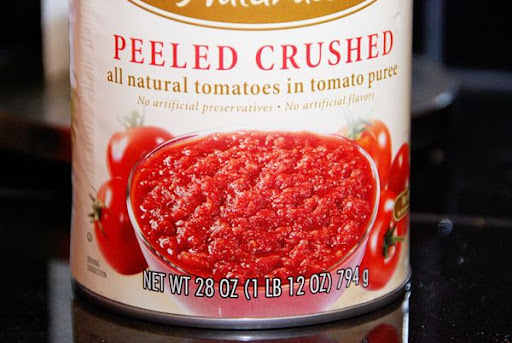 I love crushed and diced tomatoes. No one has added anything to them, so we get to control all the flavor. I love that about this recipe! Stir together the sausage and onions and tomatoes until combined into red, saucy goodness. Now, we're gonna add all the flavor. 2 tablespoons of oregano. 1 tablespoon of thyme. Not overpowering, but very Italian flavors. This part is important - 2 tablespoons of sugar. The tomatoes need this. Trust me. 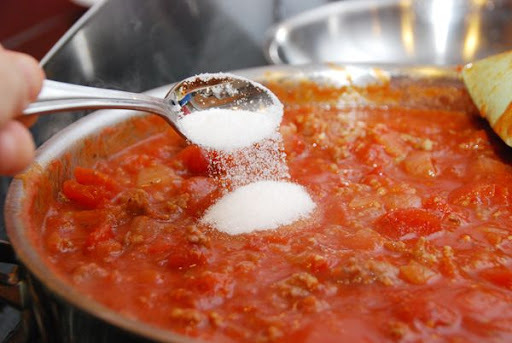 If you want to leave it out, you can, but the sugar is important to bring the tomato flavor to life. I also add 2 teaspoons of salt and 1 teaspoon of ground black pepper at this point. YES, cinnamon. What does the cinnamon do? It pulls this sauce together and makes it sing. That's the best way I can describe it. It's not a sweet cinnamon flavor - like cinnamon/sugar toast or snickerdoodles or the glorious Cinnabon. This is savory cinnamon. And, it's absolutely delicious in this sauce. Simmer the sauce for at least 20 minutes, longer if you can. Up to two hours. Or, as I eat it for lunch about once a week - over a small bowl of penne sprinkled with freshly shredded Parmesan cheese. You will love this sauce. It just might become your go-to pasta sauce, too. And, you can say that you make your pasta sauce from scratch. Try it. Use sausage. Don't forget the cinnamon. 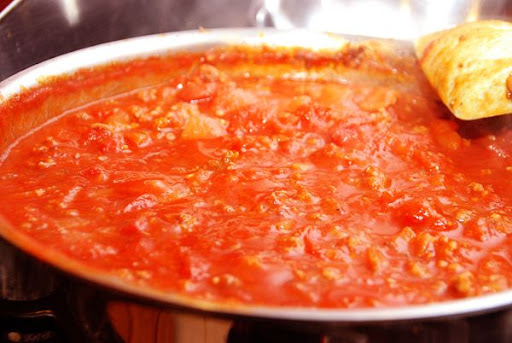 And, watch this simple, homemade sauce sing. Brown onion and sausage in olive oil in sauté pan or pot until sausage is cooked and onions are soft. 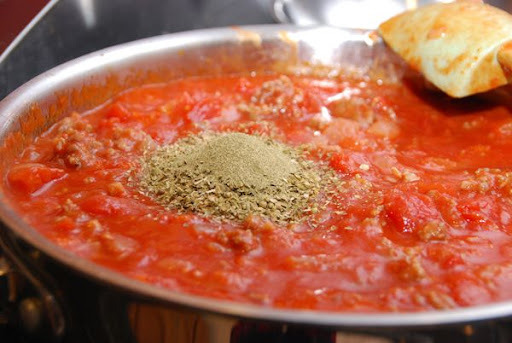 Add crushed tomatoes, diced tomatoes, oregano, thyme, sugar, salt, pepper, and cinnamon. Simmer over medium-low heat for at least 20 minutes to 2 hours. *Sometimes I add one clove of fresh, minced garlic along with the onion and sausage - depending on my mood. (Current mood: pregnant and anti-garlic) You can add 2 teaspoons of garlic powder if you want garlic flavor in the sauce as well. 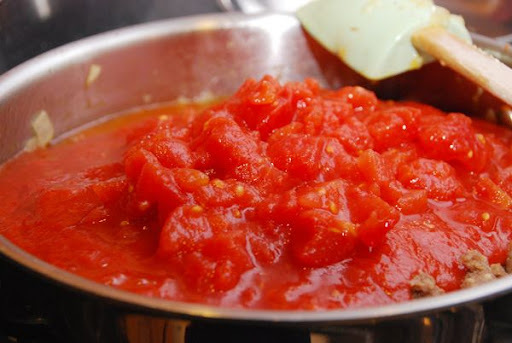 *This recipe makes 3 quarts of sauce - which is 12 cups. This is enough for my family of 5 to have dinner, some leftovers, and I freeze about 1/2 of the sauce in a freezer bag each time I make it. You are ridiculously amazing. How do you come up with this stuff? Thanks so much for sharing your awesome recipe! Cinnamon? Really? I trust you! I'll add a dash of cinnamon to my next batch of homemade sauce. By the way ... how do you like the Meijer naturals tomatoes? I have yet to try them, but would like to! I really like them. I'm SO glad Meijer is making so many of their products healthier. These tomatoes are fantastic - very fresh tasting. Cinnamon does add soooo much. My mom always added cinnamon, too...guess she still does, and she used to always get compliments on that wonderful flavor. I have also added brown sugar instead of sugar, and it is so delicious. Guess it's kind of like the dash of nutmeg in alfredo sauce. Gives that "yum, what's that special kick!" flavor! Since I'm not pregnant and anti-garlic, think I'll keep adding that to mine! ;) Hope you're feeling well! so excited to try this - i never thought of cinnamon in pasta sauce, but it sounds delish. i love cinnamon in savory dishes - i always add it to my rub for pulled pork, and it gives it a little something extra. Gosh, Beth said it all!!! I can't wait to try this. I have always wanted to make my own pasta sauce... tried it once with a friend but it turned out awful. :-( Can't wait to say I make my own pasta sauce from scratch! Thanks! I will try it. I chuckled because my mother always said the same thing about sugar and tomato sauce. No one ever believes me and it is certainly not a very popular thing to add anymore--but I believe you--and I believe the cinnamon is essential also. I tried this recipe and it was awesome. All my friends were delighted. Though I have to confess that I did have some experience because when I made that BUENOS AIRES TRAVEL I just learnt a lot about cooking pasta and it was really helpful! Now I am a pasta master! Delicious sauce! I just made it with fresh tomatos, onions, peppers and spices from my garden. I really like it but next time will decrease the pepper and increase the sugar just a bit!! Thanks for sharing your fabulous recipe!